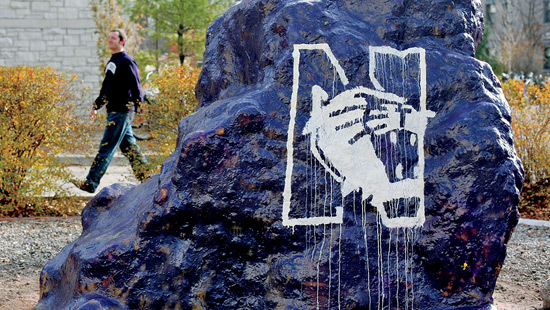 After more than 60 years of silence, representatives of the Rock, a beloved Northwestern landmark, have released its first ever statement. According to officials, the Rock has grown tired of its countless one-night stands and is in search of something more long-term. “There comes a point where you feel like you’ve seen it all, and you’re just ready to settle down,” one of the Rock’s representatives told reporters. “And this rock really has seen it all: colorful art-student masterpieces, passionate messages from protest groups, drunk frat guys struggling to hold a paint brush…and this level of variety for all these years has begun to take its toll”. Officials say that while the Rock does not plan to kick its promiscuous habits quite yet, it will be proceeding with a more cautious mindset. Students have been advised to ask the Rock out for a cup of coffee or a nice dinner before taking things to the next level. However, Martina Barrera-Smith, a psychology professor who has been at Northwestern for almost 30 years, claims the Rock is likely to stay the same. “It ain’t easy to quit something you’ve been hooked on for as long as that rock has. It’s all talk”. Reporters have tried reaching out to the Rock directly, but it declined comment.